The CloudFisher collects drinking water from fog without any energy. 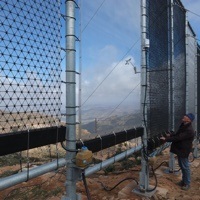 It is the first standard fog collector in the world resisting to wind speeds of up to 120 km/h. It is quickly installed, does not require additional energy and is extremely low-maintenance. All used materials are food safe. The CloudFischer can supply hundreds of thousands of people with top-quality drinking water complying with the WHO drinking water standards. If is used around the world in mountain or coastal regions with scare rainfalls and frequent fog. What’s the difference between CloudFischer and other systems? The non-profit WaterFoundation is active in countries where the scarcity of drinking water threatens the livelihood of the population and hampers sustainable development. We sponsor projects to combat water shortage and the overexploitation of natural resources, and support research initiatives in this field. We stand for information, education and the transfer of knowledge and technology to promote better use of a precious resource. The WaterFoundation supports self-determined development, enabling people to take care of their own water supply in the future. We offer concepts that are easy to implement and tailored to people’s everyday needs, taking account of cultural and environmental factors and of technical and financial constraints. The Foundation combines its projects with modern solutions for energy, health, education and income opportunities adapted to local conditions.